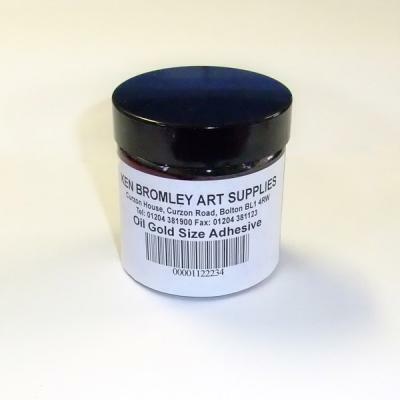 Japan Oil Gold Size Adehsive is an oil based size suitable for indoor and outdoor use and can be used on both oil and acrylic painted surfaces. Just paint over the area you wish to stick the metal leaf and then place the metal leaf face down and rub gently, The metal leaf will adhere to the areas where the adhesive has been applied. For use with Gold Leaf , Metal Leaf and Bronze Powders. Use over any non-absorbent painted surface, canvas, panel, wall, glass or metal. If the surface is absorbent as with gesso, seal with Shellac Varnish. Size is ready at about 3 hours when sellotape tackiness is reached.